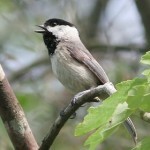 Rapid, nasal “chickadee-dee-dee.” Song is slow “fee-beee; beee” at lower pitch. Description: Sexes similar. 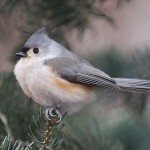 Black throat and cap; white cheeks; gray above; creamy below, with buffy flanks. Wing coverts and secondaries are broadly edged in white. 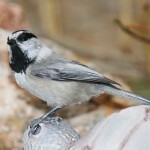 Behavior: Black-capped Chickadees are primary cavity nesters, which means they excavate their own hole, usually in soft, rotting tree stumps. Habitat: Deciduous and coniferous forests, as well as orchards, woodlots, and urban areas. Nesting often occurs in edge situations or open areas of forest. Where in Nebraska: Common permanent resident across the state. The population increases during winter months with the arrival of migrants from farther north. 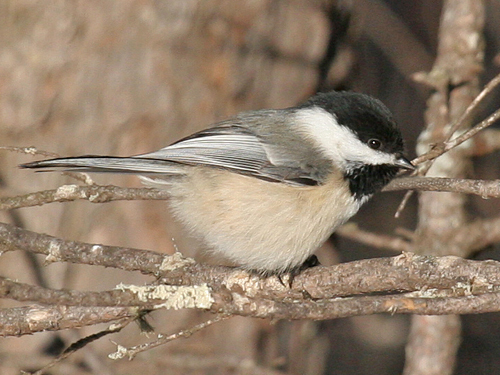 Fun Facts: Black-capped Chickadees each autumn allow old neuron cells to die and new ones to grow in order to adapt to social and environmental changes.